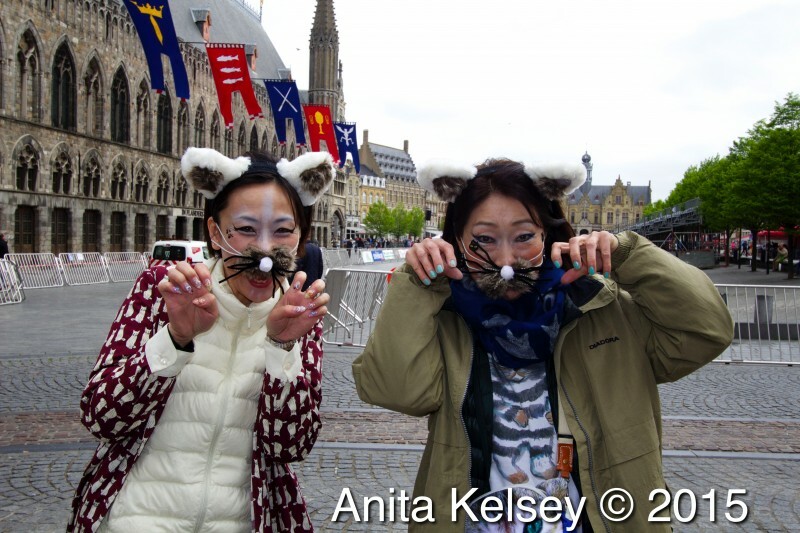 As Big Ben struck midnight on NYE, and people focused on their new year’s resolutions, I had but one thing on my mind and that was my long awaited trip in May to the Kattenstoet (Festival of The Cats) in Ypres, Belgium. I first stumbled across the Kattenstoet website in 2013 when researching the history of the cat in medieval times. 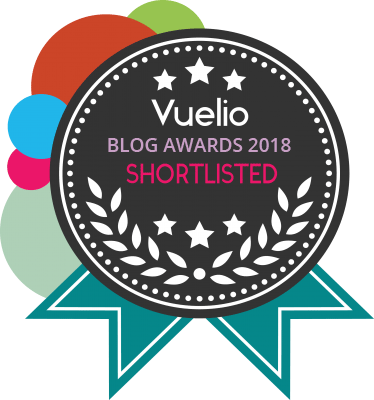 I’d never heard of the festival before, which was unusual for me; quirky cat related events normally catch my attention sooner or later but this one had remained under my feline fixated radar. Looking through the details of the festival it dawned on me that my patience would be stretched to its limits. The event is a three yearly one and I had just missed it! 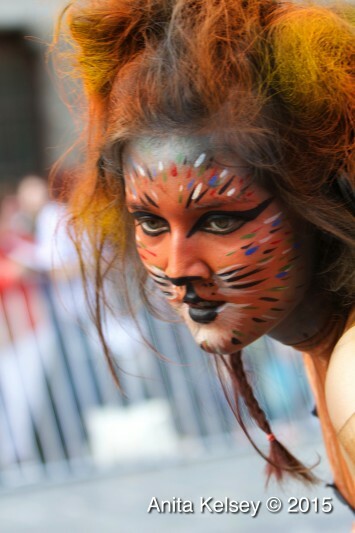 The festival is one devoted to the cat but with a sinister backdrop. Ypres was a city known for cloth making with the cloth stored in the cities tower ready for their annual fair. Cats were introduced to the tower as a solution to the sudden arrival of mice who found the cloth attractive to eat. Everything worked according to plan although one thing wasn’t factored into the equation, the procreation of the cats! Ypres was soon overrun with frisky cats breeding like rabbits that strangely led to them being thrown from the tower. Also mentioned were the usual links with cats and witchcraft that seems to be the state of affairs all over Europe during this time. According to the Kattenstoet web site the earliest descriptions of cat throwing was found in the city chronicles for the years 1410 -1420. The Ypres chronicles often link the cat-throwing with the Ascension fair that already existed in 1127. After the fair was moved to the second week of the Lent in 1476, the cats were thrown on ‘Cats’ Wednesday’. And so May arrived and 6 of my long suffering friends, were persuaded to travel with me on Eurostar to Brussels. On Sunday May 10th we all made our way from Bruges where we were staying to the quaint city of Ypres, to witness the only cat parade in Europe. We arrived way too early, hours before the festival was due to start, to bag a good spot to watch the procession. Of course, I was the most excited, whilst my friends embarrassingly looked around for any other humans. As each friend snuck off for coffees and snacks I guarded our bit of pavement with military precision from the invasion of erm, no one. I did feel a tad silly refusing to budge from my spot in an otherwise empty town but as time went on and the slow drip of people with fake ears and drawn on noses started to turn into a river of frenzied cat obsessed anthropoids,guard duties became more necessary and each friend returned to map out their spot with jackets and bags, showing a united ‘don’t even attempt to push in’ front. Even small kids trying to crawl through the knees of the crowd to find a good vantage point, were sent back with a hardened determination. At 3pm Ypres streets were packed full of international cat lovers as well as proud local residents, some of whom had dragged their dogs out to try to regain some sense of balance and normality. Not that three dogs in a pram is normal or balanced! The sound of several brass bands resonated in the distance as the 42nd cat parade started and once again took its deserved place in history. The procession made its way down the narrow cobbled streets through excited crowds that included a small curly haired fever-pitched woman from London with a camera lens the size and weight of a canon. The procession lasted for several hours with hundreds of fantastic colourful costumes, magnificent cat and mouse themed floats and much humour from dancers, fire throwers, actors, stilt walkers, local kids and a curiously British penny farthing cyclist with whiskers. 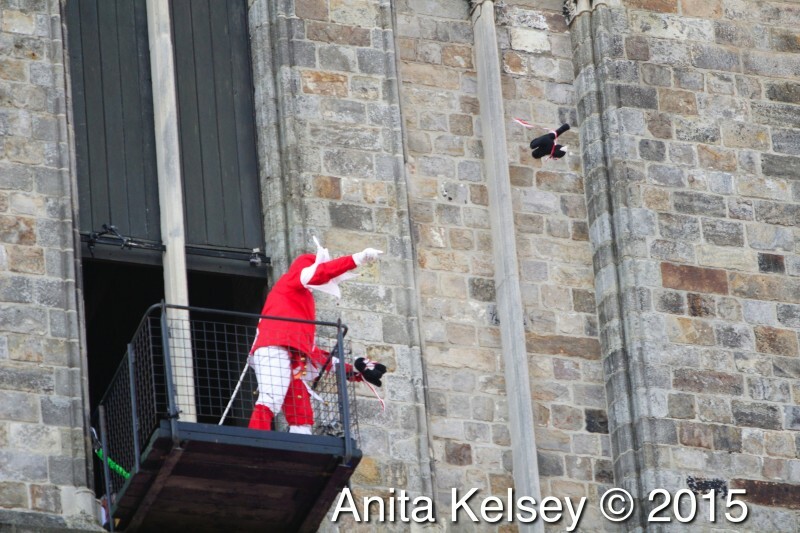 The fun ended with the famous cat throwing from the tower (toy cats – the festival finishes each time with the throwing of toy cats, by a court jester, to a raucous crowd below (the last living cat was thrown off the tower in 1817). It was bizarre to watch thousands of people with outstretched arms, eager to catch a cat, shouting up to the jester as he teased the crowd with pantomime style crowd-pleasing antics. Equally bizarre was watching stuffed cats flying through the air in every direction. As Ypres said its final farewell to its 2015 Kattenstoet, releasing lots of huge cat faces made from balloons into the sunset, I realised I was not alone in being utterly devoted to the cat and its amazing story from being vilified to becoming one of the worlds best loved and most common pets. My weary friends and husband on the other hand continue to look on in despair. The next cat festival will be in 2018. Start the countdown! Anita Kelsey holds a first class honours degree in Feline Behaviour and Psychology (work based BA Hons) and runs a vet referral service dedicated strictly to the diagnosis and treatment of behaviour problems in cats. She is also a qualified cat groomer and specialises in grooming aggressive or phobic cats. Anita writes for Your Cat Magazine and is on their experts panel answering readers questions on cat grooming. She also advises on feline behaviour for the CFBA (Canine and Feline Behaviour) magazine as well as being a full member. Anita is based in Notting Hill, London, and consults all over the UK as well as international requests. She lives with her husband, a music producer, and two Norwegian Forest cats, Kiki and Zaza. To contact Anita please email info@catbehaviourist.com or visit http://www.catbehaviourist.com. This entry was posted in Cat Travel, Mews and tagged cat, cats, cute, funny, katze, katzen, kawaii, Ypres, ねこ, ﾈｺ, 猫.
Ypres, known by British troops as “Wipers” is more famous as the site of a bloody First World War battle. Thank you Anita for telling us about this unique Cat Festival and the great pics. I always associate Ypres with the horror of WW1. This feline celebration certainly makes us see a more joyful side to the town. I do think that we, Cat Lovers from all over the world, should plan to meet in Ypres in 2018. Can you imagine the group discount? Wow! That would be so cool to attend. Some really cool floats and people dressed as cats! Great pics! Thank you for the sharing them. Unfortunately back in the day when they threw real cats all of us would have been burned at the stake as witches. Humanity has come a long way but still has a very long way to go. But I love a good cat themed festival…especially since real cats are no longer harmed. 2018? Hmm. It’s a long way from Seattle, WA USA but one can dream. Great story and event coverage, love it. Unlike anything I’ve heard of before. Very interesting background and pictures. I need to go to this! Looks amazing! Ive known about this for roughlty the same time as you, but Im jealous as I still need to go! It was so hard to get to Ypres from anywhere in Belgium when I researched it though; I dont drive and there are no trains?!!! Where was a good place to stand though? Also how long did you stand for to get a good vantage point? I may take a little foldaway camping chair whilst I wait.